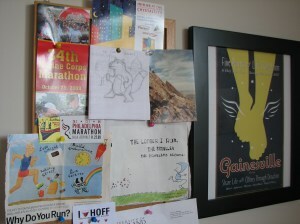 Longtime readers may remember that a couple years ago, my obsession with sports psychology led me to put together an inspiration board full of photos, race ads and magazine cutouts that motivated me to run. My inspiration board, circa 2009. The content of the board has changed since then, from Marine Corps Marathon ads to photos of the Chesapeake Bay Bridge to quotes about working through injury, depending on my training goals. I disassembled the board before moving it to Virginia Beach, and noticed today that it’s still almost empty, except for some remnants from the ski season. 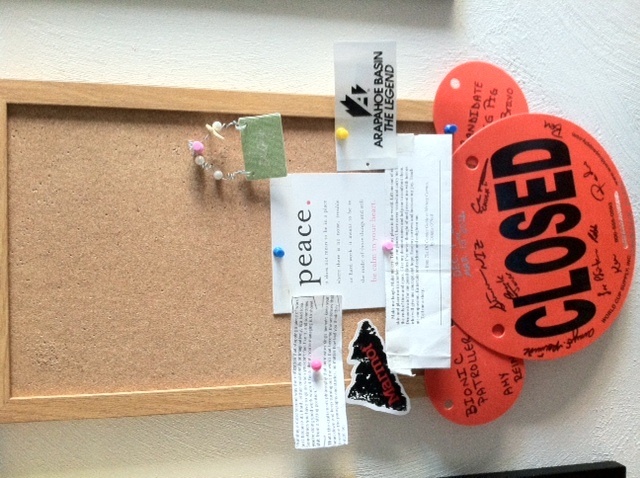 My current inspiration board: Full of opportunity. My first impulse was to frantically page through the latest issue Runner’s World while eating my steel-cut oats this morning, looking for ads for the Philadelphia Half-Marathon, or the Virginia Beach Rock ‘n’ Roll Half Marathon, something, anything to fill the empty space. Of course, I had it all backwards. I’m now kind of excited about the blank slate. Because the motivation board isn’t about creating goals, but about reminding yourself of what motivated you to get through your last long run, or what gets you to jump in the pool rather than turn around and hit the sauna. Since I can’t pin Eminem and Nicki Minaj to the board, it will have to remain a work in progress for now. Do you have an inspiration board? If so, what’s pinned to it?